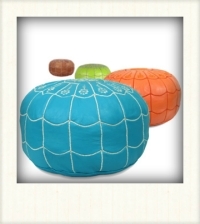 We Retail and Wholesale Moroccan poufs, Pouffes. 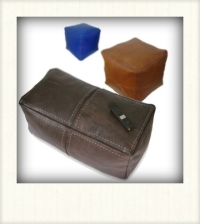 Our Moroccan poufs are not only a successful design, but they are ergonomically comfortable because they are filled to keep their original shape after several usages, so you can enjoy your poufs for long years ahead. 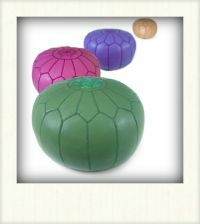 These colorful poufs will make a great addition to your home; they can be used as a footrest or a coffee table or simply as decorative creation. 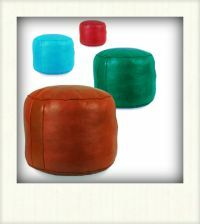 these Moroccan poufs are made out of genuine leather by skilled artisans, which makes every pouf one of a kind piece made just for you. 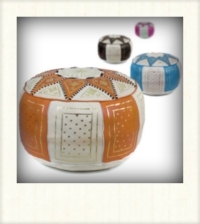 we offers stuffed and Unstuffed poufs, We use a clean polyester fiberfill to stuff our Moroccan poufs and make sure they are sturdy and firm, if you would like to get your pouf stuffed, please make sure you select this option when adding a pouf to your cart.